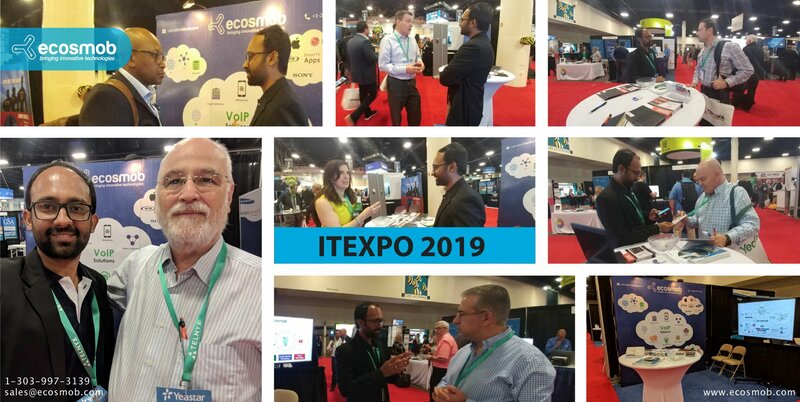 Significant presence and participation at the most awaited IT EXPO 2019 - held on Jan 29 -Feb 1, 2019, at Greater Ft. Lauderdale, Florida. The Ecosmob Kingpin and Co-Founder Mr. Maulik Shah ceased each moment, with a magnificent volume of visitors and insightful meetings. In this 28th edition of IT EXPO, 2019 technology exhibition awed us with a marvelous quality of service and courteous arrangement. We left with a scintillating experience witnessing more footfalls then last year. This year we participated in many knowledge sharing sessions showcasing craft of Next-Gen Carrier and much more. There were few great learning points of these sessions such as SD-Wan, SBC, WebRTC & managed services, we thoroughly enjoyed the breathtaking content. IT Expo 2019 served as an extraordinary platform for trending technologies by industry-leading exhibitors and was visited by IT experts and business owners. Value-Worthy Meetings This time, we hit it hard- our visit to leading annual Tech Expo. We had an overwhelming response at Ecosmob Booth #635, we attracted many amazing visitors which praised and were intrigued with our expertise with VoIP solutions. It was surely evident that with a strong word of mouth at our booth that visitors are loving our concepts and solutions we were offering; definitely looking forward to many projects and partners in the future. We had numerous valuable networking meetings - an opportunity to meet many prospective future partners and clients. Sharing his IT EXPO 2019experience Co-Founder of Ecosmob Technologies Pvt Ltd; Mr. Maulik Shah “ We have clearly surpassed several initiatives this year collaborating with our milestone mobile app developed and powered by Ecosmob Technologies at IT EXPO. There is a fresh urgency to transform and diversify revenue verticals with VoIP Tech Experts. We understand the agendas which sit in several boardroom agendas; it is cost optimization digitalization which is bringing true digital transformation. That’s where Ecosmob comes in and we open new verticals and channels of success to help businesses focus more on the core functions. Pouring our experience of partnering with a significant mobile application- a new initiative. We partnered with a mobile app company in USA as a brand new initiative “Sharethatslide” which was an app used at very much the IT EXPO venue, the app helps people see presentations while the speaker is giving the presentation. Also, users from any location anytime can go back and catch up with some interesting segment, which can also be shared with your partners and associates as well. Ecosmob was the show-stealer being on the aisle and of-course captured many eye-balls for being successful and versatile at the IT EXPO along with the presenters. Ecosmob is now not strange; rather presented credible and reputable tech company for international companies. With now trend changing with a better economy, IT EXPO visitors feel comfortable with applying modern apps for their businesses. Yet another successful tryst with IT EXPO 2019, Ecosmob expresses heart-warming Thank- you to all our fab visitors and prospects – We have made it possible and take the notch higher! This IT EXPO 2019 was truly magnanimous which helped us expand our footprints in USA.